So much of what children learn about food depends on context. I know this is a subject that Jo has covered before but I wanted to underscore some of her very important messages and to give our own perspective on the importance of positivity when introducing children to new foods. 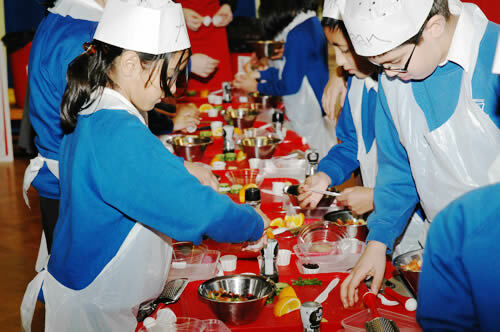 I say 'our' perspective; I'm writing this post as a director of Junior Chefs' Academy - Britain's leading provider of practical food education workshops for primary age children. We started out as a small family business back in 2005 and we now work with around 50,000 children every year, visiting schools up and down the country. In a previous post, Jo said that children are "little emotional sponges" and that seems absolutely right to me. They really pick up on a mood and that can strongly affect their response to an opportunity. In all our workshops, right from the word 'go' we do everything possible to generate a sense of action and excitement. Partly, that's because we think that's the best way to keep kids engaged and absorbing information, but it's also very much about creating a strong association in their minds between food, learning and fun. For example, we ask lots of questions during the course of a session. "Who can name this fruit?" is a common one that usually sends a forest of hands rising into the air. And what's the prize for a correct answer? A vegetable stick, a piece of fruit or perhaps the chance to sample the juice of a freshly squeezed mango. The important point here is that, suddenly, healthy food is a prize. It's something to be coveted and won - not some kind of dubious-looking specimen held out in tiny fragments on the end of a hopefully proffered spoon. That in itself sends an important unspoken message. Pride in ownership is another powerful force for encouraging a sense of culinary adventure. Teach a child how to prepare a fruit coulis or a Berry Stack Summer Pudding and they'll be delighted to take their new creation home to display to the family. And when they've learned that the strange little orange fruit sitting atop the stack is called a physalis, they're normally only too keen to show off their new found knowledge. Likewise, when they've seen and worked with all the ingredients that go into a 'Pirate's Pineapple Creole,' they realise that there's nothing to be suspicious about - and the fact that they've made it themselves can be a source of great pride and self respect. When they're imbued with all that positivity, it's amazing how often children's usual (and, in fact, enormously common) reticence about strange foods disappears. Of course, this is no sure-fire solution. Children can have very strong inhibitions when it comes to trying new foods and we've yet to discover any magic formula that will have every child clamouring for their five-a-day. Nevertheless, demystifying the whole business of food preparation - engaging them in the process of food shopping and encouraging them into the kitchen to prepare things - certainly helps to send many of the right messages. This process of encouragement and demystification is a really important dimension of our work. Attitudes to food and patterns of behaviour are often entrenched from a very early age and they can go on to have lasting effects on an individual's health and fitness. Our goal is to ensure those patterns are healthy ones: that kids associate food with fun and learning; that they know it's okay to ask questions about where it comes from and how healthy it is. We want them to feel at ease in the kitchen and confident about experimenting with new tastes and food experiences. Fundamentally, it's about changing what kids view as 'normal'. If they see fresh fruit and vegetables in the home every day, and if they see the rest of the family enjoying them on a routine basis, then the chances are it will only be a matter of time before they give them a try. It may take time, they won't take to everything and progress will probably happen in little steps rather than in great strides but when we're dealing with a subject as important as healthy eating, every forward step counts. Every child is different, of course, and so there can never be a single, guaranteed recipe for success. However, we've seen time and again that fun and positivity really do play a very important role in creating the right atmosphere and encouraging children to be more open to trying new things. Games, quizzes and active involvement in the food preparation process are therefore great ways of helping children to build their confidence, expand their knowledge and, above all, to have fun with food.